Spring activity is blooming across the country! The Tsongas Industrial History Center at the Lowell National Historical Park will offer a Teacher Creativity Studios: Asian Pacific American Cultural Presence in the Classroom workshop for teachers with the Smithsonian Center for Learning and Digital Access in Lowell, 4.7. 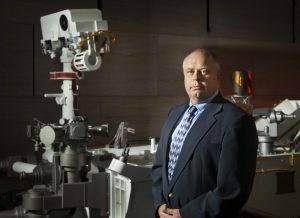 Dr. John Grant, geologist with the Museum’s Center for Earth and Planetary Studies (CEPS), in front of a full-scale model of the Mars Rover Curiosity, will be a featured speaker at Framingham State University in Massachusetts. Framingham State University will feature a talk by National Air and Space Museum scientist John Grant on moving the Mars rovers as part of the Science on State Street Festival in Framingham, 4.21. Attendees to the National Association of Automobile Museums conference will spend a day at the Smithsonian for talks and tours, thanks to conference organizer the Antique Automobile Club of America Museum in Hershey, 4.10. Teen teams from the Upcountry History Museum (SC), Fort Worth Museum of Science and History (TX), Arab American National Museum(MI), Rockwell Museum (NY), and the National Underground Railroad Freedom Center (OH) will digitally connect to the Smithsonian Secretary’s Youth Advisory Council meeting in Washington, 4.11. The Art + Science lecture series continues with a talk on Native responses to the environment by National Museum of the American Indian educator Ed Schupman at the Rockwell Museum in Corning, 4.12. The St. Louis Science Center opens SITES’ Destination Moon exhibition in St. Louis, 4.14. Mystic Seaport hosts a talk by National Museum of Natural History geologist Liz Cottrell on Expeditions to Arctic Volcanoes as part of its Adventure Series in Mystic, 4.19. 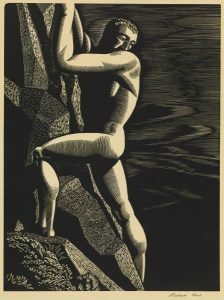 The High Desert Museum will open Ascent: Climbing Explored exhibition featuring artifact loans including two paintings, brushes and palettes from the Smithsonian American Art Museum, in Bend, 4.28.